This unique Adobe Muse template is perfect for contemporary Restaurants, Cafes and Bars. 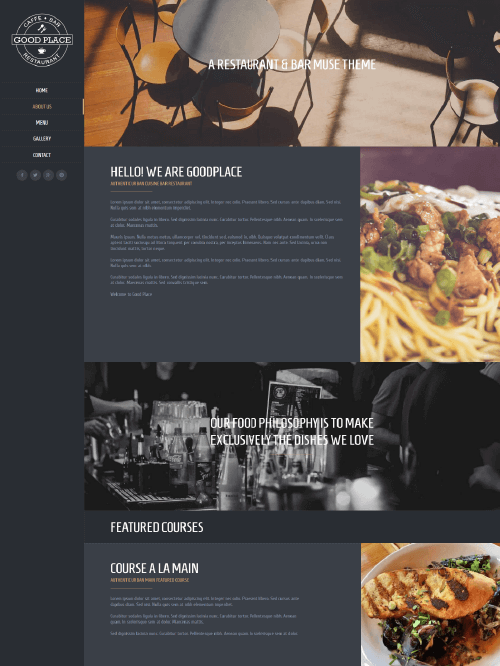 Good Place is fully responsive and its main features are Super-easy install and fast workflow which will let you build a restaurant website within a couple of hours. The theme contains all standard pages needed for a restaurant website including home, about us, menu, image gallery and contact. It also includes our Snazzy Maps widget which lets you have a custom styled map for your website. And with its casual design, focused on imagery and complimented with unique font and background styles it will let your website come to life. Present your restaurant or cafe images with style with custom parallax sections and fully responsive images sections. Additionally, Good Place comes with an awesome full screen image gallery. This professional looking gallery will let you create that edgy look that is in high demand. See the Good Place live demo and see why it's the best solution for your restaurant & cafe Muse project. Modern and aesthetically beautiful responsive Restaurant, Cafe/Bar, Gastropub Adobe Muse template. Good job, like the menu on the left side. See the Good Place live demo and see why it’s the best solution for your restaurant & cafe Muse project.